Hair Fuel Razor Sharp Shaving Gel acts as a protective barrier between the razor and your skin whilst performing a clean shave. Its cooling effect helps soothe any feel of irritation. Hair Fuel Shaving Oil with incredible protective barrier absorbs quickly to soothe and smooth the skin without clogging pores. Ideal for all skin types including sensitive skin, our After Shave oil hydrates to replenish damaged skin and leaves your face soft and healthy. After Shave Lotion: Refreshing And Toning For A Immediate Cooler Feel After Shaving. Best applied on a clean, slightly damp beard. Add 4-6 drops of oil into palm, gently work the oil into your beard, goatee or moustache from root to end. Groom and style as normal using a boar bristle brush or comb. Use back of thumbnail to scrape out small amount, rub between hands until dissolved. Apply to beard from roots to tips, working it gently through the hair, ensuring full coverage. Use hands or a beard comb to complete application and style as desired. 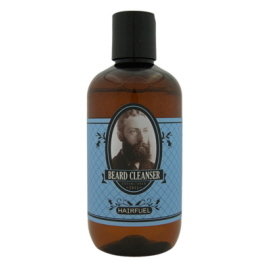 Perfectly suited for the man who wears a long or coarse beard and is looking for subtle hold. This conditioner enhances shine and has a pH-balanced formula designed to condition and soften facial hair, without weighing it down. Skin protect will help replenish, revitalize and protect skin from environmental attacks and the stresses of shaving while supporting long and short term Moisturizing effects. Hair Fuel Traditional Hair and Beard Shampoo, gentle safe and effective for sensitive areas.